Last Saturday a group of these merry fanatics gathered at the Bill Good Day Park in Torch Lake. They were checking out the terrain, deciding whether there would be enough space for a regatta, taking a few lazy recreational swoops. Winter people bond quickly, and a reporter trundling across the ice in her Yak-Trax was welcomed to the party. That being said, what they do after strapping on helmet and ice picks is to lie on their backs in those little wooden boxes and fly across the ice at up to five times the speed of the wind, maneuvering their craft using the same principles that apply in conventional sailing. The helpful how-to stories on their website include Rescue throw bags, Holes in ice, Broken screw extraction, and Quick and dirty claws. Richards likes ice boating on Torch Lake. The ice is good, parking and access are convenient at the Day Park, and a nice warm café with clean bathrooms is just a short hike away at Sonny’s Torch Lake Market. “More women would get into this sport except for the potty problem,” she laughs. Richards knows a lot about ice boating history and recommends some good websites. 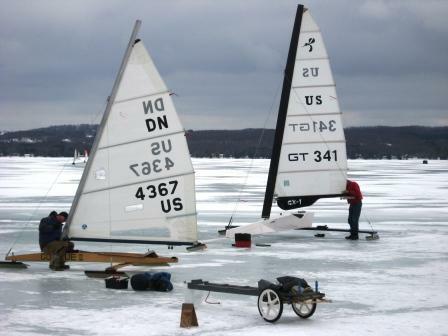 If the weather cooperates, the ice boats will be back in Antrim County this weekend, either on Torch Lake or Elk Lake, for the annual Fun Regatta. 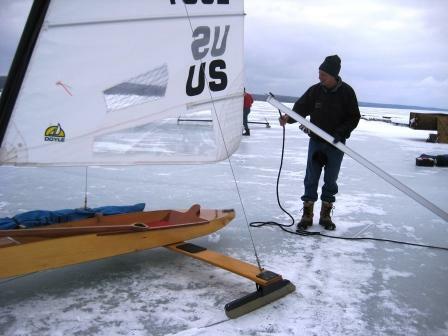 If the thought of broken screw extraction and quick and dirty claws doesn’t scare you, you can learn more at the Grand Traverse Ice Yacht Club website. 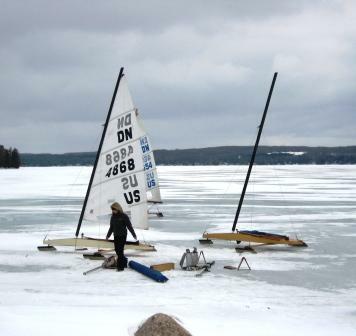 Please send me information regarding any ice boat racing on Torch Lake. Hi, Bob. Everything I know is in the stories here. You might follow the link to the Grand Traverse Ice Yachting Club to find people who actually do this stuff.